What Will We Grow? All of the Things! We spent this evening with members of the Occupy Richmond Gardening Group, watching Return of the Killer Tomatoes and planting the seeds both groups purchased last weekend on our field trip to the Acorn Collective in Louisa County. If you didn’t know, Acorn runs the business Southern Exposure Seed Exchange, who have over 700 different organic and heirloom seed varieties. You can order from them here: http://www.southernexposure.com/ The seed company supports a really great egalitarian community in Virginia! We ended up with a couple hundred different baby plants. We are starting them in the 4th bedroom at the Wingnut, which gets South-East light, so we are pretending it is a greenhouse! We are growing a large variety of herbs, flowers, hot peppers, and vegetables! Hopefully we will have an awesome garden at the Wingnut this Spring and Summer! 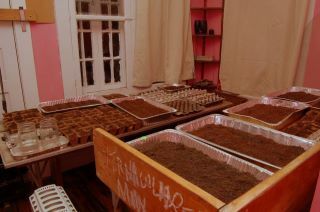 And the Occupy Richmond Gardening Group seems to have a lot of plans for their baby plants too. Today in court, Hunter Singleton accepted a plea deal offered by the prosecutor. The spurious charges of possession of a controlled substance had been previously dropped. Today, the prosecutor also dropped the Felony charge of wearing a mask. In exchange, Hunter took an Alford Plea (basically not saying you are guilty but recognizing that there is evidence against you) to a misdemeanor Disorderly Conduct charge. He was given 90 days, with 87 suspended. He had already served 2 days after his arrest, and will serve 1 more day on Friday. It is excellent news and a great relief to many of Richmond’s activists, anarchists, and Occupiers that Eric Scott and Hunter Singleton have faired relatively well regarding their charges with resulted from a November 9th Occupy Richmond March. The use of felony charges seems to be a scare tactic by the Richmond Police Department. Participants in the march were using bandannas soaked in vinegar to protect from potential tear gas being used by the RPD (they have a tendency to use tear gas in crowd situations on a fairly regular basis). The felony charge of wearing a mask is a terrible law, and certainly one for anyone participating in political actions to keep in mind. Hopefully one day Virginia will be free of this repressive statute. Please come out to support Richmond anarchist and activist Hunter Singleton at his Pre-trial court appearance on Wednesday January 18th at 11am at the Manchester Courthouse on Richmond’s Southside at 920 Hull Street. Two activists, Eric and Hunter were arrested on November 9th during a march for Occupy Richmond. They were on the sidewalk, when Eric, then Hunter, were grabbed by Richmond police and dragged into Monroe Park. They have been charged with the Felony of wearing a mask in public.They were part of a large group of people who applied apple cider vinegar to bandannas and scarves as a preventative measure against tear gas the Richmond Police are well known for using. The legal, peaceful march they were participating in knew that there were dozens of Richmond Police awaiting them around Monroe Park. Additionally both are facing charges of disorderly conduct. Eric is facing a concealed weapons charge for the food tool he had in his backpack for eating apples with, and Hunter is facing a controlled substances charge for his prescription medication. The charges they are facing could result in up to 5 years. Eric has taken a plea deal on his charges, but Hunter is still dealing with the courts. Please come out to show your solidarity with Hunter! The Occupy Richmond Gardening Workgroup and the Wingnut Anarchist Collective are getting ready for some awesome Spring time gardening! We are getting together in February to plant seeds, which we can grow indoors until March, so we can have awesome, nutritious, delicious gardens in Richmond! Containers for planting seeds in! We might have resources to share as well, more TBA! Come on out if you want to help plant seedlings that we can grow to feed communities around Richmond. 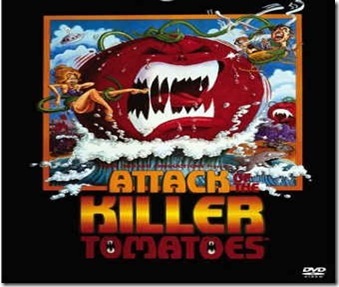 We will also be watching Attack of the Killer Tomatoes at some point during this event (TBA). The Wingnut is a sober, all ages space. Kids are welcome! Last night, 4 members of the Wingnut headed up to Charlottesville to participate in a solidarity march for Eric Scott and Hunter Singleton that was being put together by Occupy Charlottesville. When the 4 of us arrived we were warmly greeted, and welcomed to their occupation. Folks there wanted to know about what had happened to Eric in Richmond, and what the situation was. Enough people wanted to hear that a Mic Check was initiated, and Eric spoke to the group. He told them about what occurred on November the 9th, and also of how the arrest, experience with jail, and pending charges made him scared in some ways, but made his struggles more important, and that he would not back down. Hopefully we will have footage of Eric speaking later today, as well as copies of Occupy Charlottesville’s statement in solidarity with Occupy Richmond. The group marched through the downtown mall, stopping twice to read statements- one in solidarity with Occupy Richmond, and one about the SWAT raids of Occupy Chapel Hill on Sunday. Chants of No Justice No Peace, and Cops Here, Troops there, U.S. Out of Everywhere echoed through the downtown mall. On the way back to the park, the solidarity march took the streets, with 4 black flags in the mix. Who’s Streets? Our Streets. Who’s Park? Our Park. Afterwards, an occupier took the 4 Richmonders out for vegan pizza, and we got a chance to talk to folks in Charlottesville. Volunteer for upcoming video on Virginia Mask Law!! A good friend is organizing and filming a video as a response to the recent charges brought against local activists Hunter Singleton and Eric Scott. If you can make it out to help with this project please do! In response to last week’s arrests and the subsequent felony charges laid upon two peaceful protesters I will be taking portraits tomorrow, Monday, November 14th at 3 pm in monroe park for a short video/promo advertisement for the new website… richmondlegalsupport.org . … The video will have a series of portraits all containing people wearing various ‘socially accepted’ masks ie; scarves for the cold, motorcycle helmets, respirators, santa claus beards, etc. These will be shown silently and the video will end with someone wearing a handkerchief and a brief statement about the city charging students and local activists with a class 6 felony for wearing one. If anyone would like to take part please come out and bring a mask (preferably one that is functional, though anything and everything is welcome). No one’s name or identity will be used or even asked for. The point is to show how we all use these ‘dangerous’ masks on an everyday basis and stripping someone of their rights (right to vote, access to jobs, loans, etc and the social stigma associated with a felony conviction) for something so inherently trivial and innocent can not go unquestioned. For more information please feel free to contact me but if you want to participate you can simply show up. Hope you all are warm and wonderful! The Wingnut Anarchist Collective will be hosting a movie screening next Saturday, November 19th at 7pm as a benefit for Eric Scott’s legal fund. We will be screening PickAxe a 94 minute film by Crimethinc. If you enjoyed our screening of If a Tree Falls last month, you should enjoy Pickaxe, which is a longer piece about the occupation of a national park by environmental activists, which was mentioned in If a Tree Falls. We are asking for people to bring a 3 dollar donation if they can, but no one will be turned away. Please come out to watch this film, learn about Eric’s case and other recent legal cases of Richmond Anarchists, and to maybe decompress a little too. Eric Scott is one of the 2 people being charged with a felony for wearing a mask during last Wednesday’s Occupy Richmond march. In case you missed the screening or want to watch it again, here is the documentary by Richmond’s amazing Kontra- All Night, All Day on the Occupy Richmond movement. All Night, All Day from Kontra on Vimeo.